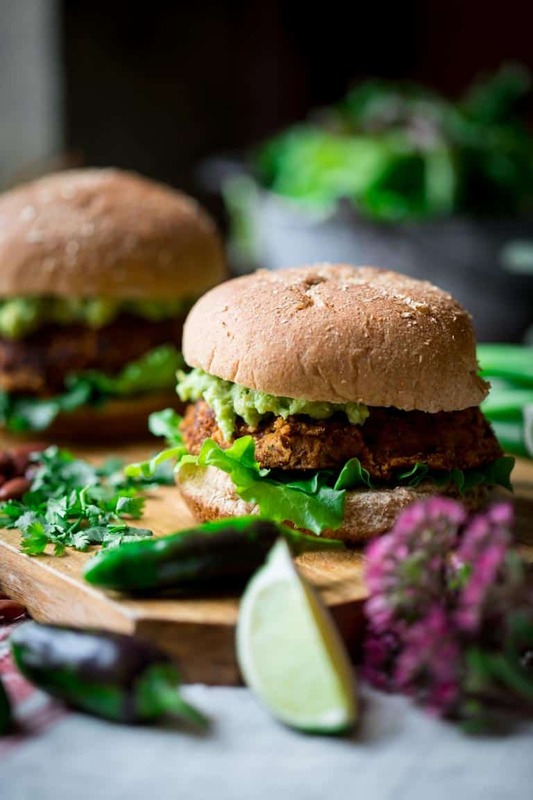 I am telling you my friends, these Southwest Bean Burgers are in a league of their own. 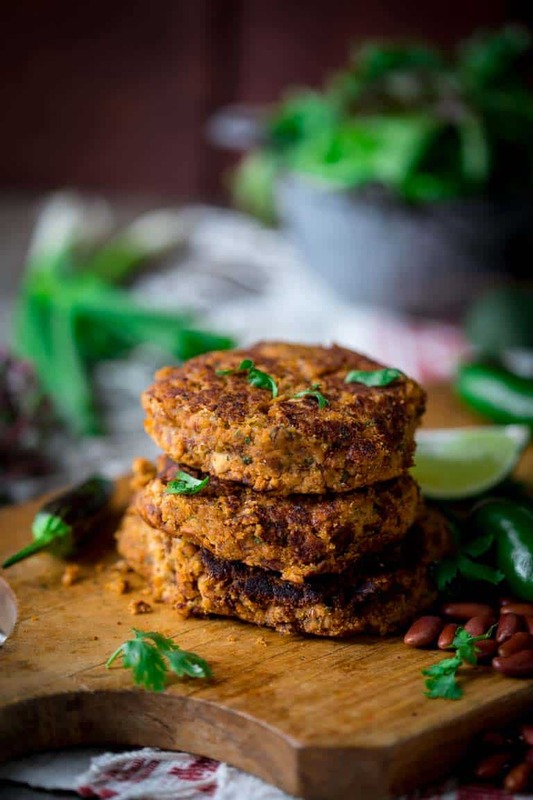 They are savory and tender patties of goodness that will satisfy all of your vegetarian comfort food cravings! I originally shared this recipe on December 28, 2011. I have updated the images and some of the text today. In a way, I wish veggie burgers weren’t called burgers at all. 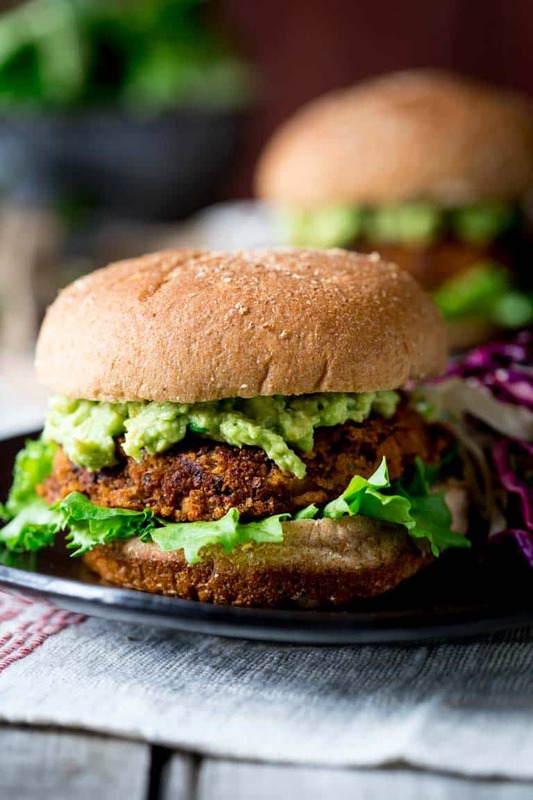 With a name like that, one might expect this plant-based patty in some way will approximate the more traditional beef burger. 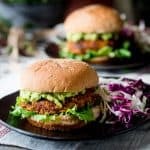 But for all of us who have tried any of the scores of vegetarian bean burgers on the market, we know that even the ones that try to recreate a meat-like encounter are far from beefy. And I’m okay with that. I like to think of veggie burgers as something unto itself. There are a whole slew of meat-free burgers, pre-made and ready to heat from the freezer. Some promising a Texas barbecue experience. Come on! Really? Obviously the crackpot who came up with that name has never been to the Austin Barbecue Belt. Well, these bean burgers are not trying to be meaty. These are trying to be beany! 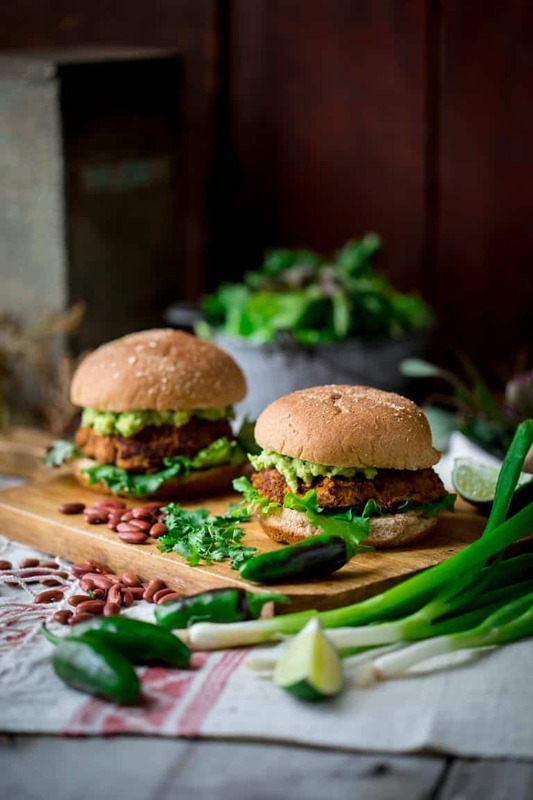 A few weeks ago I got a big bag of dry kidney beans from a local farm and they became the star of the show in these vegetarian burgers. These are giant, full-flavored, fall-apart-tender bean burgers. And they’re proud to be nothing like a hamburger. They would be amazing served with my Skinny Oven Fries, Vegan Potato Salad with Herbs or Skinny Classic Coleslaw! You’ll need to refrigerate the cooked beans, uncovered, for at least 2 hours. Don’t skip this step, as this is what helps these burgers stick together and gives them the most incredible texture. Those beans are just waiting to absorb all the good flavors in this simple recipe. The scallions, garlic, onions, jalapeños and spices really add a delicious Southwestern flair. 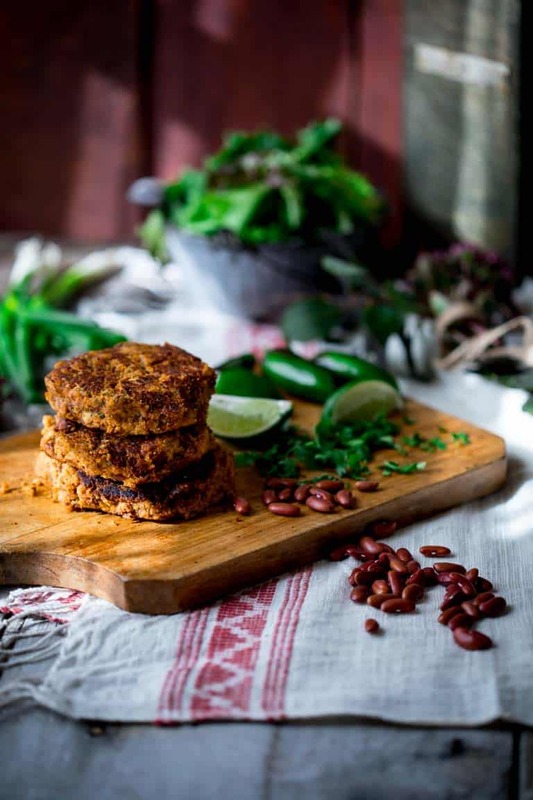 These vegetarian bean burgers are far from bland, and you can play with the spices as much as you’d like! To make these burgers spicier, keep the seeds in the jalapeño pepper (be careful, the seeds are really hot!). Watch the mixture carefully when you’re pulsing in the food processor. You still want to see some whole beans intact, as this will help hold the burgers together. If you pulse the mixture for too long, you’ll be left with a bean paste, which won’t fry up well. 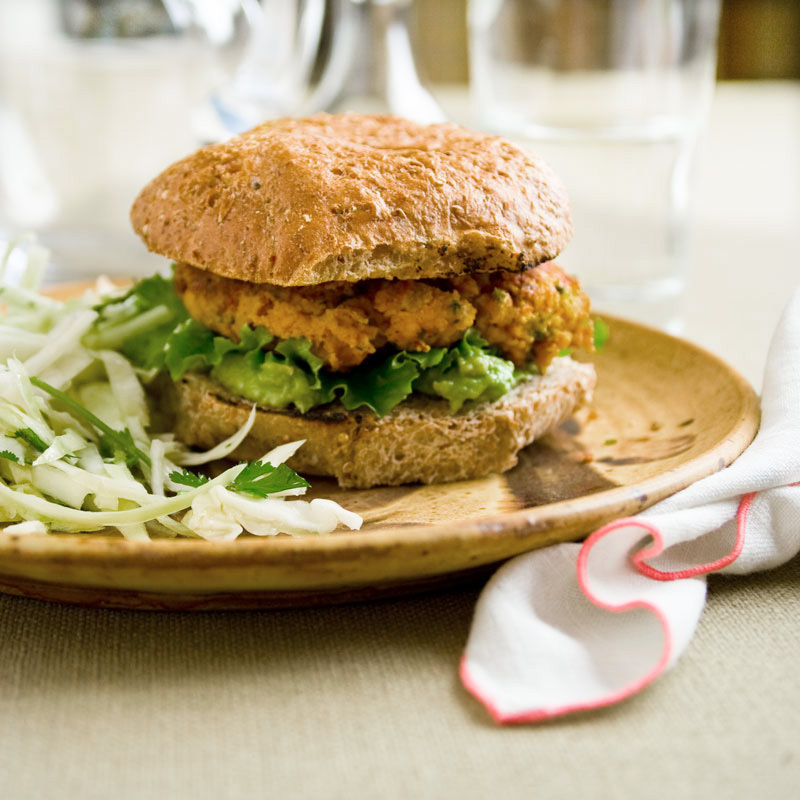 It’ll still taste good, but your bean burgers will be too crumbly to stay in your bun. After dropping the bean patties into the pan, cook them undisturbed until the bottoms are browned. This will make them easier to flip and will make these burgers look even more appetizing. If you gave the beans enough time to dry properly in the fridge, your bean burgers should brown up nicely without issue. Feel free to add a little more oil in between batches of burgers to keep them from sticking to the skillet. Don’t forget to stop by down at the bottom of the post and let me know what you like to put in your favorite meatless burgers. If you try this recipe, please make sure you come back and give it a star ating too! And if you haven’t already, make sure to sign up for our email newsletter. We send it out every Saturday morning, so you won’t ever miss a healthy recipe! These fall-apart-tender bean burgers have a Southwest flair. We love them loaded with homemade classic guacamole on a whole grain bun. If you are gluten-free, find gluten-free buns in the freezer section of your health food store. Or simply serve along side slaw and potato salad. Soak beans in cold water 8 hours or overnight. Drain, rinse and place in a large saucepan. Cover with a generous amount of cold water and bring to a simmer over high heat. Reduce heat to maintain a gentle simmer and cook, uncovered until the beans are tender, 40 minutes to 1 hour 45 minutes. This will vary depending on the freshness of the beans and length of soaking time. Drain beans and refrigerate, uncovered, until cold and dried out, at least 2 hours. Heat 1 tablespoon oil in a medium skillet over medium heat. Add scallion whites, garlic, onion and jalapeno and cook, stirring often until starting to brown and soften, 4 to 5 minutes. Stir in chili powder and salt and remove from the heat. 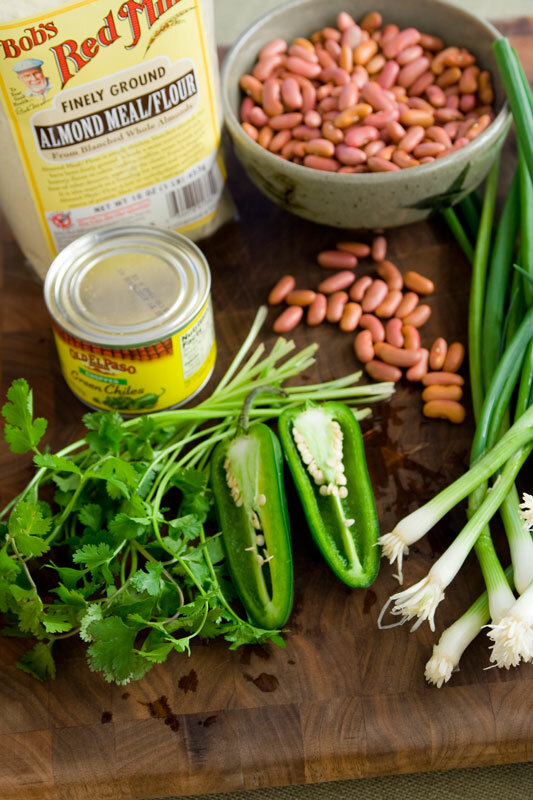 Place the beans, green chilies, egg, almond meal, cilantro, lime juice, and the onion mixture in a the bowl of a food processor fitted with the steel blade attachment. Cover and process in quick pulses to form thick coarse paste, about 25 quick pulses. There will still be some whole beans intact. Stir by hand to mix any undistributed ingredients throughout the mixture. Preheat oven to 325ºF. Lightly coat a baking sheet with cooking spray. Heat 2 teaspoons canola in a large non-stick skillet over medium heat. Drop bean mixture into the hot oil by a scant 2/3 cup to create 3 mounds and cook, undisturbed until the bottoms are browned, 3 to 4 minutes. Carefully flip the burgers and continue cooking, gently pressing down with a spatula to flatten into patties. Adjust the heat as necessary to prevent scorching until the patties are hot all the way through and browned, 3 to 4 minutes. Transfer the patties to the sprayed baking sheet and place in the oven to keep warm while the other batch is browning. Wipe out the skillet with a clean towel and return to the heat. Add the remaining 2 teaspoons canola oil and heat. Cook the remaining 3 burgers in the same manner as the first batch, adjusting heat as necessary to prevent scorching. Have you experimented with freezing these? There are only 2 of us and I would love to make a big batch to have some on hand. Any suggestions? [quote name=Jen]Have you experimented with freezing these? There are only 2 of us and I would love to make a big batch to have some on hand. Any suggestions? [/quote]Great idea! I haven’t tested it though. Let me know if you try it out. For the record, left-overs re-heat really well in the microwave. it sounds interesting but it definetly looks good! Thanks Betty. I hope you enjoy it! Does it have to be almond flour or can I use wheat flour? [quote name=Donna]Does it have to be almond flour or can I use wheat flour? That’s a good question. I haven’t tested it, but my guess is you could substitute dry (whole-wheat) breadcrumbs. I think wheat flour would be too dense, and might be kind of raw tasting. If you have breadcrumbs I’d start there. Let me know how your tinkering works out. Happy cooking! 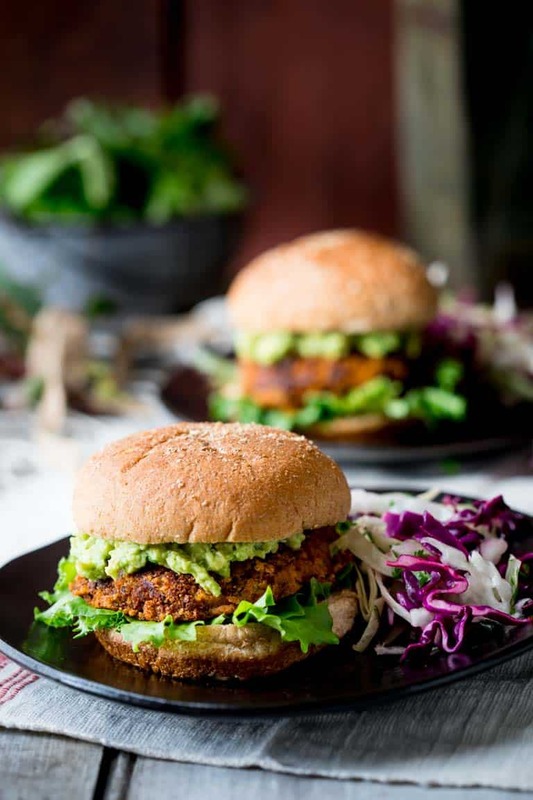 Vegetarian or not, you’ve gotta give it up for a good bean burger! This one looks absolutely delish- definitely need to try! Thanks Karly! We love bean burgers 🙂 thanks for coming by. I’ve been looking for a good veggie burger recipe, and this one sounds great. I just wish it had more protein. I’m thinking that I can serve something else with them that adds more protein to the meal. Hi Susan, I am a protein gal too. A couple thoughts, you could add a slice of cheese (7 g protein), and or you could pair this with Ezekiel Buns https://www.foodforlife.com/product/buns/ezekiel-49-sprouted-whole-grain-burger-buns for an additional 9 grams of protein. Enjoy them! This is a marvelous burger and I’m going to use the basic recipe with a number of different spices. if you are truly concerned about health, I suggest not cooking with Canola which is a GMO product with fields cleared with glyphosate. Hi Suzanne. I am so glad you love the burgers! Yay! I appreciate your coming back to let me know. Thanks so much for your note about the canola oil typo. I am so glad you pointed out that out. This recipe is actually from 2011. 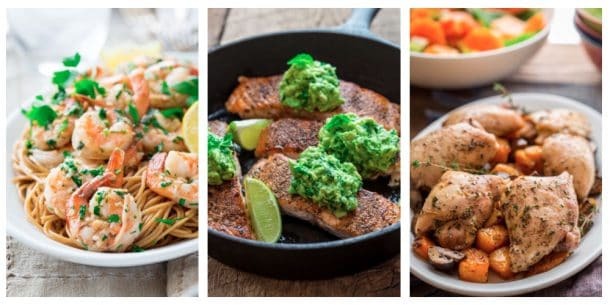 In 2014 I made a site-wide and brand change to move forward calling for “avocado oil or organic canola oil” when using a neutral high-heat oil in any recipe. If you have my cookbook (2015), you’ll see that is the case there as well. We have been updating these old recipes, and I made an error in forgetting to make that change. I have done so now thanks to you! So thank you. 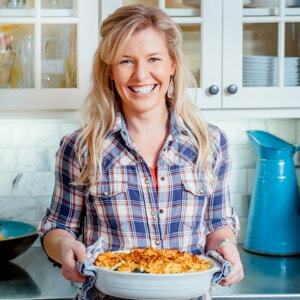 If you would like to read more about the toxicity of canola oil you can read about it here http://www.eatingwell.com/article/283992/is-canola-oil-toxic-or-bad-for-you-the-facts/ on EatingWell where I am a contributing editor. As a rule, I lean on the experts, dietitians and editors there to help me in pouring through all of the latest research on health and wellness. They stand by the use of canola. I personally recommend Organic canola only because organic canola is not GMO nor is it sprayed with Roundup. Hope this clears up my stance on the matter. Happy Cooking!